I recently had one of the strangest trips to get food I’ve ever had (not in a bad way). If you ever decide to check out Mary Jo’s Pizzeria make sure you plug it in your GPS because you might just pass it up. Everything is fine when going to pick up your pizza, until you make a turn into an alley. Then you play a little game called “Can you guess which house is also a Pizzeria?!”. 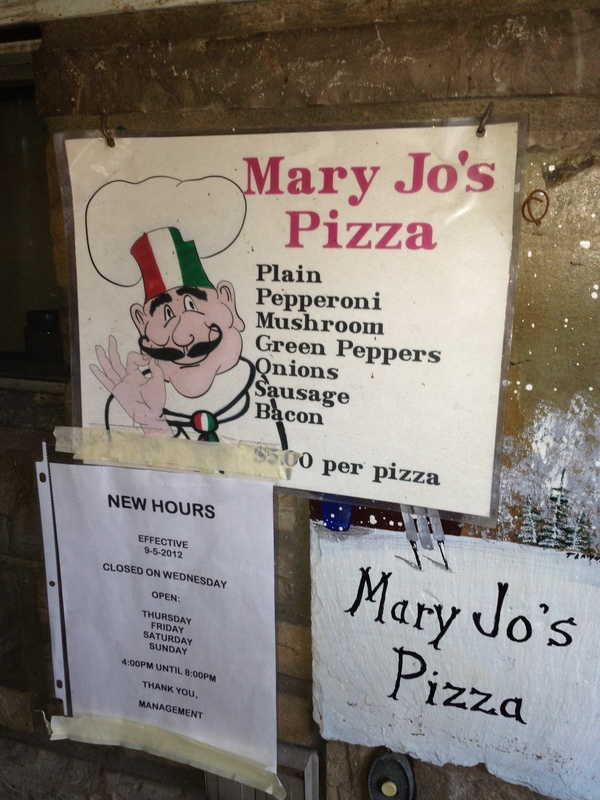 Mary Jo’s Pizzeria is in the basement of a house and you can only get pizza for pick up. You walk up to the house, there is a door with a buzzer. You ring the buzzer and then the pizza gets passed to you in a small slot on the door. It makes you have this feeling that you need to look over both shoulders just to make sure nobody is watching. I ordered 1 Pepperoni and 1 with half sausage and half green pepper just to try a few toppings. The sauce was a little sweeter than what most places give, but that’s fine it just makes Mary Jo’s a little more different than it already is. I usually like sausage and mushroom pizza but I wasn’t crazy about the sausage on this pizza, it tasted like breakfast sausage. The Pizza’s only come in 1 size which I would probably say is slightly larger than a personal pan. 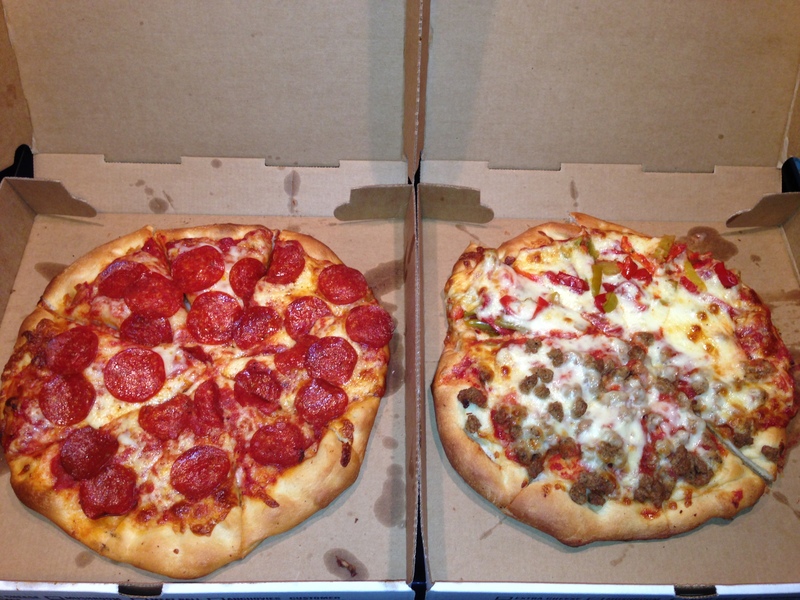 How can you really go wrong with a $5 pizza?! My friends and I usually get Little Caesar’s $5 when we get together but I may give Mary Jo’s a try with the group next time to see what they think. I didn’t know what toppings they had until I saw the menu outside (pictured above). Next time I am definitely trying the bacon pizza! Leaving Mary Jo’s all I could wonder is how many people order pizza the first time and pass it up? 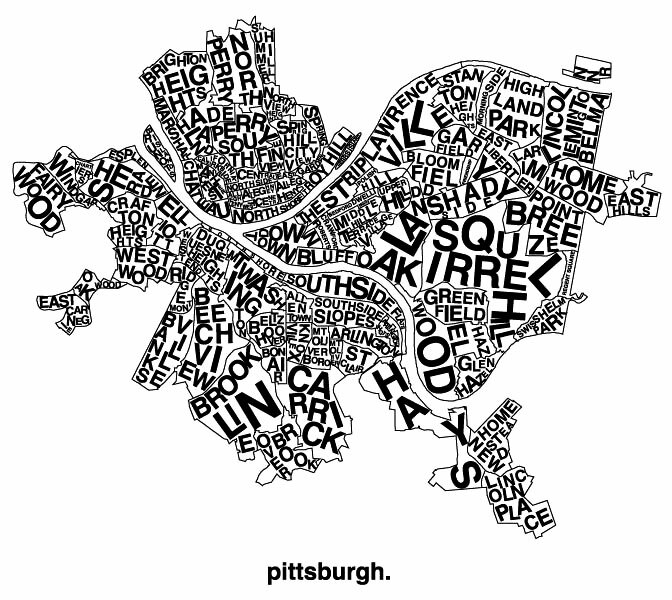 However, random places like Mary Jo’s Pizzeria is the reason I started this blog in the first place.